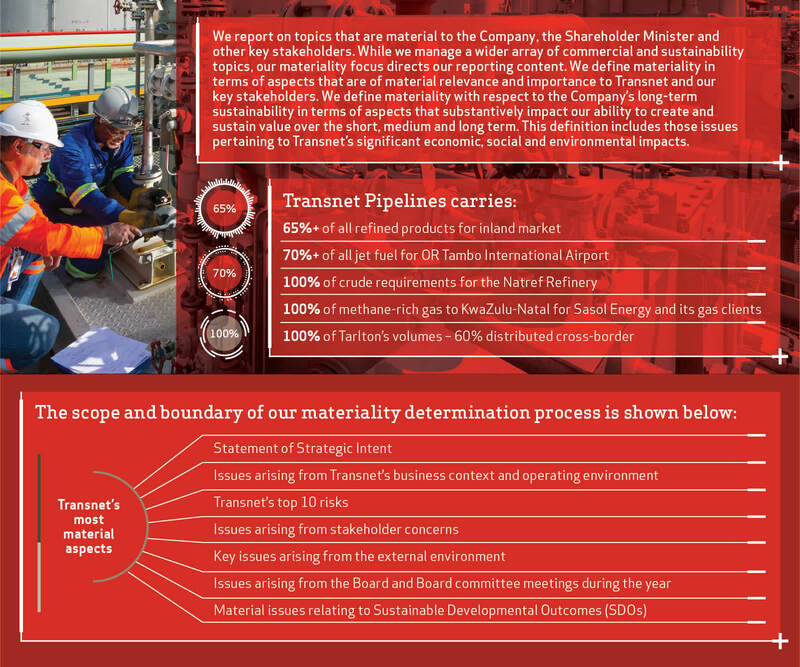 Transnet determined material aspects through a structured process of identifying relevant issues and prioritising those that are most material to the Company’s commercial, social and environmental contexts. Figure 10 summarises the levels of accountability for identifying, validating and approving Transnet’s material issues, as well as the criteria used during each stage of the process. In validating material aspects, we considered the severity of impact on the Company. Figure 10 shows the areas of the business considered during the process of deriving and validating material aspects. Aspects were measured quantitatively in potential ZAR impact (e.g. top risks), and qualitatively in terms of value impacted (e.g. the impact on reputation, natural capital, relationship capital and strategy). Further, results from the 2017 Multi-Stakeholder Perception Survey reflected that Transnet’s brand and reputation were severely compromised during the year by inadequate stakeholder engagement and a perceived lack of transparency and accountability. Accordingly, we identified the material issue of ‘Transparency and accountability’ as an addition to the materiality cluster, Build social trust through ethical leadership and corporate citizenship. The Company does not yet have firm measures for tracking performance for these aspects. Where appropriate, they are addressed qualitatively in this Integrated Report. * Quantitatively measured in potential ZAR impact and qualitatively measured in terms of value impacted (e.g. impact on reputation, natural capital, relationship capital and strategy).